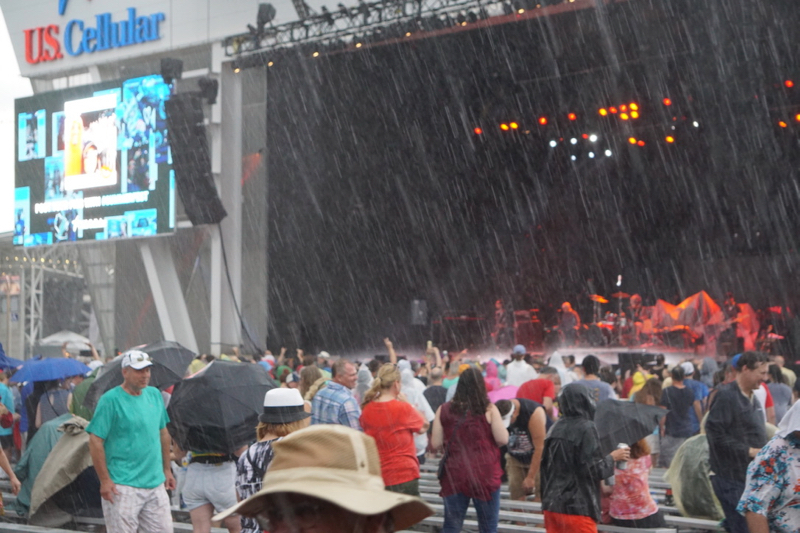 The skies opened up during the band&apos;s fourth and final song. Published July 1, 2018 at 6:35 p.m. It didn't look good 10 minutes before the alleged 4 p.m. showtime. 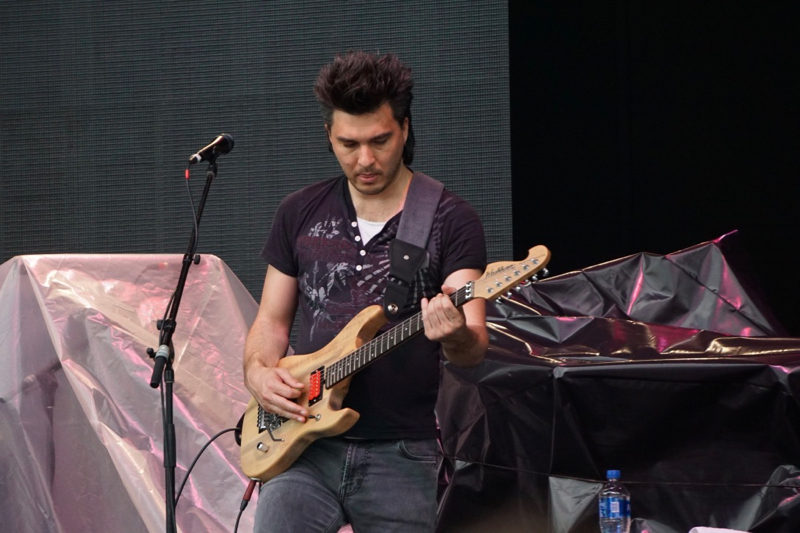 With the new video board at the U.S. Cellular Connection stage warning us "SEVERE WEATHER APPROACHING," all the keyboards were covered with black tarps. Thunder clapped in the distance, and I wondered if I should run. Run so far away. A Flock of Seagulls is far from my favorite '80s band. In fact, my biggest connection with the Liverpool band was my haircut in the early '90s – and now frontman Mike Score is bald, and my poofy do is but a distant memory. If either of us had that much hair, the wind and humidity today would've sent it straight up. Then the rain would've washed it away. 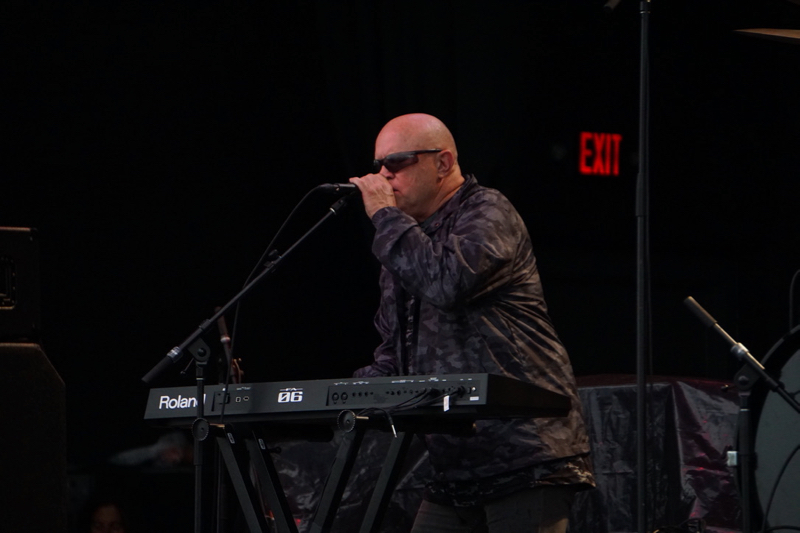 But at least Flock of Seagulls made it four songs before lightning and torrential rain ended their abbreviated set. I wasn't brokenhearted, and in fact, the rain didn't feel horrible when it dropped the game time temperature of 94 by about 20 degrees. Honestly, I'm not even a huge fan of their biggest hit by far, "I Ran (So Far Away)," even though I love the New Wave genre as a whole. So no big loss on not hearing it. So was it worth the hassle to write this review of a one-to-three hit wonder's Summerfest show – when they played zero of them? Yes and no. I shared some laughs with strangers huddling under the beer tents. Because it didn't start until 4:35, I got a chance for some people watching, too. 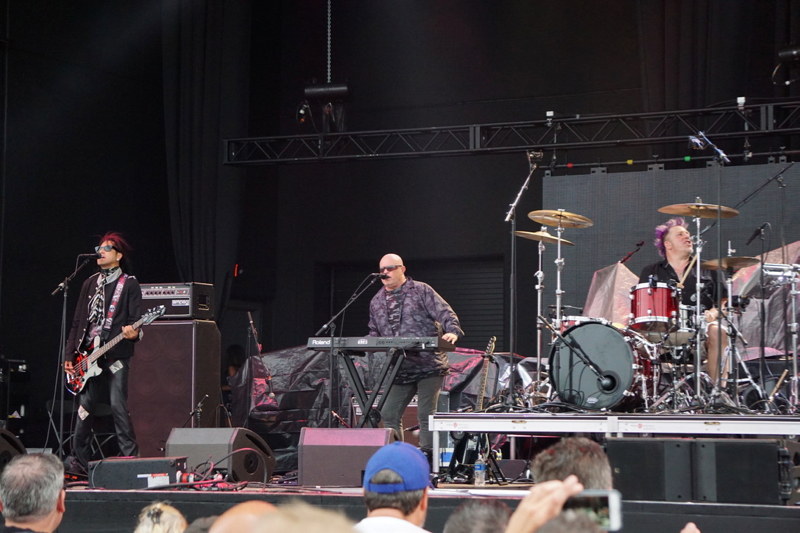 And, just like previous Summerfest shows I reviewed, like Howard Jones, OMD, Huey Lewis, Devo, The Go-Gos and New Order, I kind of like the "oldies" circuit. It's the music of my childhood, and I guess that makes me old. I'm OK with that. Of course, it's not really fair to compare A Flock Of Seagulls to New Order or Devo, and so I won't. Other than "I Ran," they really only had three other hits, all between 1982 and '84. Before the show, I had to reacquaint myself with their catalog. I remember "Space Age Love Song," (1982), probably because it gets played on First Wave on Sirius XM, but their other tunes I don't know if I've heard since Friday Night Videos on Channel 4. In other words, I'd be lying if I said "Wishing (If I Had a Photograph of You)" (1982), and "The More You Live, the More You Love" (1984) were really top of mind in 2018. Not that they had a chance to play any of those songs. Instead, we got four songs that I've never heard before, although kudos to the soaking couple next to me singing all the words. "Are you with us tonight, Milwaukee?" shouted guitar player Gord Deppe. Sure. Kinda. As the rain increased during "Hearts On Fire," this crowd was tested. Some fled for cover, but plenty of others stayed put. 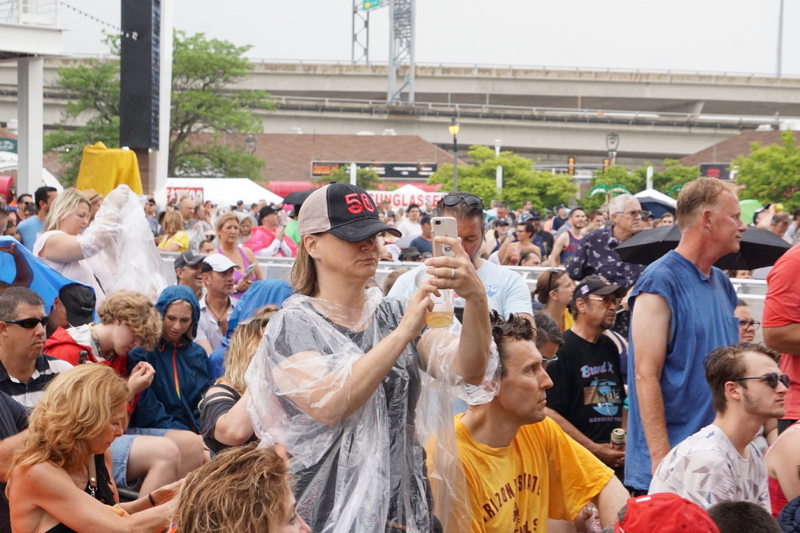 A drizzle doesn't scare Summerfesters. "Rainfall" was a good choice for their third song. Then it poured, and that was enough. The band left the stage after the next tune, "Nightmares." I can't really assess this abbreviated performance, which is a bummer, since it was the first show I've seen on the new U.S. Cellular Connection stage. Although wandering around, mostly to keep my camera dry, the acoustics didn't sound particularly good. Not sure if that was because of an abbreviated sound check, the band, the weather, or the stage, itself. 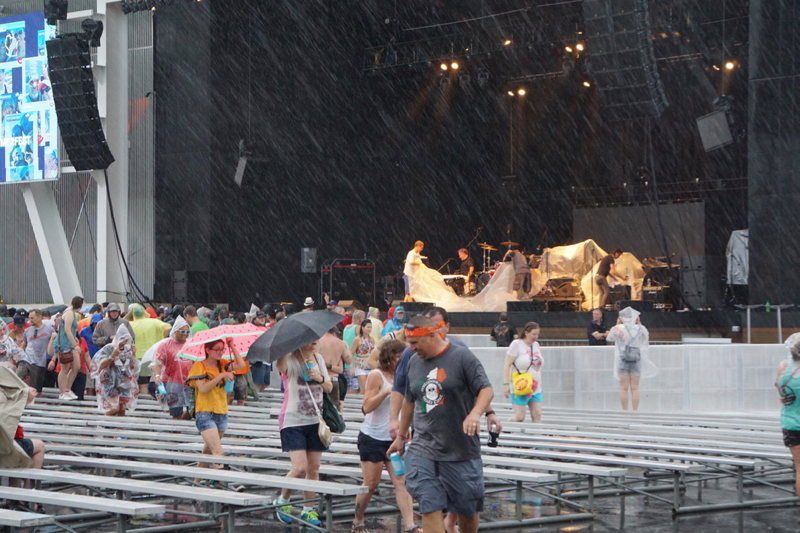 I'm sure it will really shine in a packed 10 p.m. Summerfest show, but that will have to wait for another day. I was just happy to get home without my camera getting ruined. Hey, we tried. 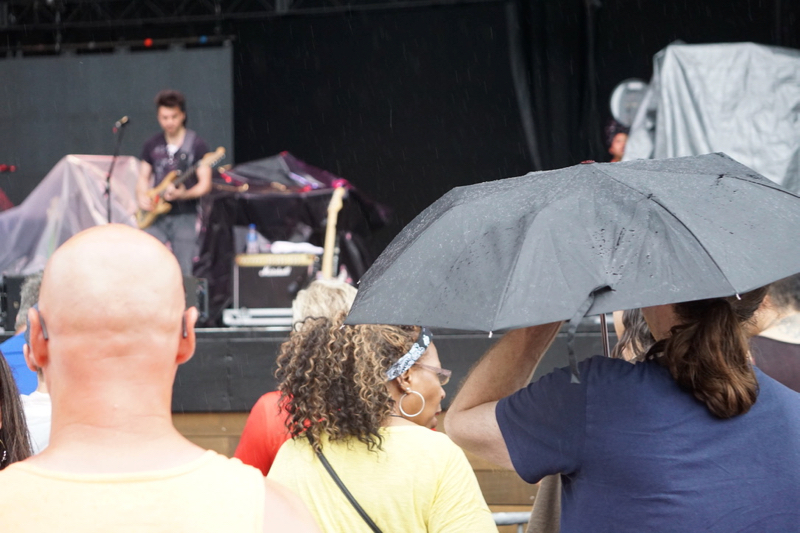 People wore parkas or just braved the spitting rain – until they couldn't. Maybe next time, A Flock of Seagulls.